Total Network Inventory (TNI) is computer inventory management software that was created to ease the life of network administrators and IT-department leaders. It’s able to investigate a local network to detect every single device connected to it. When using this software product, you will get all the information about machines on the local network, including data about their configuration, programs installed on them and license information. The software is also able to warn its users about possible problems with servers and work stations. All in all, this is a very handy tool which is able to display information in the form of informative and easy to understand reports. While browsing the data revealed by TNI, you get a nice opportunity to see the state of your network computers during particular periods of time or investigate the data from various points of view. You may use this program to scan Windows, Linux, Mac, FreeBSD and virtual machines. It’s also able to collect information on generic devices that support SNMP. How to Start Using Total Network Inventory? TNI is really easy to install: you just start the setup file and tell the program where to store the information. You may put the database on your desktop or on a file server. As soon as you do this, the scanning process may be initiated. Remember that you don’t need to work with the deployment agents as the TNI computer inventory management software installs the agents on remote devices automatically. The installation process is also finished in no time, and TNI is quickly ready for work. You may save your computer selections and re-scan specific computer sets a little bit later. TNI requires authentication on remote computers: you need to configure the credentials used to log in remotely. If you’re a Windows computer user, you may use the current user as default login or make the necessary changes. For SSH and SNMP logins, it’s recommended to specify the credentials in the Edit tab. The scanning process is highly customizable. The scan is run on each machine, and the scanning progress of each device is displayed with the help of a separate bar for each computer. How to Reach Software and Hardware Inventory Details? When the scanning process is completed, the inventory information can be reached through the Viewer & reports tab: you’ll see the number of physical and virtual devices and the number of operational systems which comprise your local network. TNI will also inform you about the computers that need Windows updates or don’t have effective antivirus software installed. The Software section is meant to provide you with the detailed information about the software installed on the remote computers on your local network. You can get information about hotfixes, firewall and antivirus status, and update configuration and status from every single machine. Even if the program wasn’t registered properly, you may reach its Program Files folder. TNI also reveals all installed codecs and database engines. The hardware inventory section displays all the data that the Windows Device Manager provides. This section is viewed when you need to get an overview of all user accounts on your network as TNI is able to list domain user accounts and local user accounts in one place. You can also get information about network shares, autorun applications, environment variables, status of system services and running processes. TNI is flexible software. For instance, you may add extra information about the devices like their price or installation date or other information and organize this information into folders. If you need to find anything on your network, use the search field. For instance, you may use the filter function to hide the sections that don’t contain the necessary data. You may also look for inventory information about a particular computer by using the navigation pane on the left hand side. While using the Edit tab, you may edit information about users or even add new users that you don’t have in Active Directory. 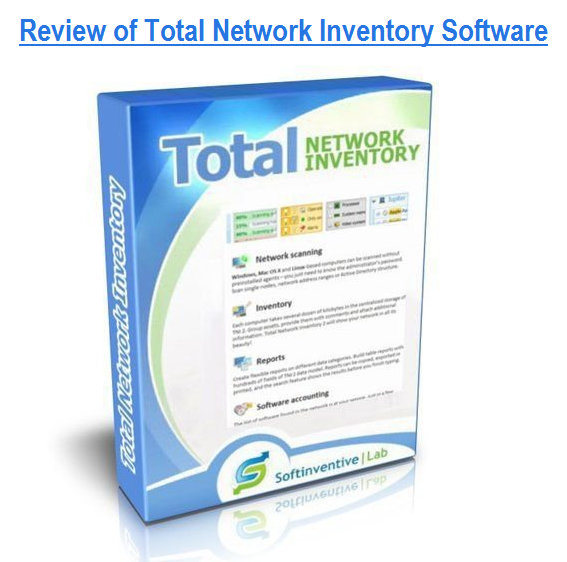 Total Network Inventory designed by Softinventive Lab is an effective tool for license management and software inventory. It helps you gather all software data from your Windows and Mac devices and display it in one place with comprehensive search and filtering capabilities. You just browse, organize, and discover your software and installations with the help of this software product.